Pork and apples is a winning combination. This dish is pretty, fast, and easy—and it pairs well with beer and the dark rye bread. Each week, we’ll be publishing a recipe from I Like Pig, the official cookbook of New York’s Pig Island festival. Here’s the catch: Each recipe will focus on a different and glorious part of the pig, so you can cook your way through the whole swine. Today’s pork and apples recipe comes courtesy of Nethe Plenge, chef and author of Flavours of the Danish Southern Islands. This pork and apples dish is pretty, fast, easy, and excellent with both beer and the dark rye bread. 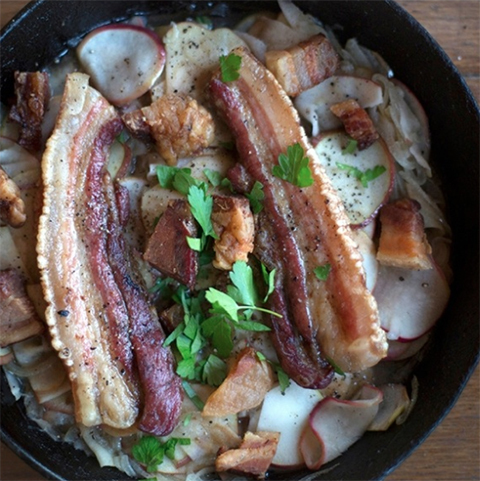 Copenhagen cookbook author and chef Nethe Plenge says, “Apples are perfect together with pig. This recipe is a common Danish dish, served in the autumn and the winter.” She recommends using tart tasting apples of the sort typically used for baking pies. Thickly slice the pork belly and smoked bacon. Spread the slices on a baking rack set over a deep sheet pan and bake for about 45 minutes, turning the meat at least once so that it crisps and browns on both sides. Remove the pan from oven, and let cool. When pork is cool enough to handle, cut belly and bacon into lardons or bite-sized pieces and save the fat. Meanwhile, thinly slice the onions and cut the apples into wedges, removing the cores. Place the apples in a large bowl of water with the cider vinegar to keep them from browning. Cover the bottom of a large sauté pan or skillet with some of the reserved pork fat—a few small pieces of bacon in the fat are fine. Heat the fat over medium-high heat until it begins to shimmer. Quickly fry the sliced onions and apple wedges in the fat from the meat. Both the apples and onions should be tender but not soften to a pulp. Season to taste with salt, black pepper, and fresh thyme. Sprinkle with a bit of cider-vinegar, if desired, and toss with bacon and pork belly and serve immediately.